I’ve been tracking my daily habits for a couple of years now. Originally I did it purely as a reminder to do certain things every day. Now I track my habits to help me measure how successful I am with each one in my monthly reviews. Tracking things you do every day can get complicated, especially if you’re tracking several habits at once. These apps below range from simple checklists to habit-building social networks, to personal data hubs. Hopefully you can find one that suits you. Update: Since we released custom tracking in Exist, you can now use Exist as a habit tracker! Custom tracking lets you create your own tags for anything you want to track, and it looks for correlations between those tags and all the other data you sync to Exist from your smartwatch, fitness tracker, or other apps. It can help you understand what makes your habits stick and what makes them harder to build. Learn more about how custom tracking works here. Productive might look familiar if you’ve ever used the iOS app Balanced. It’s by the same developer, but goes deeper than Balanced does. Productive includes a calendar view and stats to help you review your progress, lets you add notes to your habits, and includes reminder settings for each habit. Productive’s stand-out feature is that it groups habits by time of day, so in the morning you’ll only see habits you want to do early, and afternoon or evening habits will show up later in the day. Coach.me (formerly known as Lift) has evolved a lot since it was first released. It originally focused on the “Seinfeld method” of building up a chain by completing your new habit every day. (Fun fact: although this method is widely attributed to Jerry Seinfeld, the comedian denies any knowledge of it.) Recent updates have added more flexibility, with options for completing habits a few times a week instead of every day and choosing when the app sends you reminders. Apart from being quick and easy to use, Coach.me offers simple stats on your progress including the total number of times you’ve completed a habit, your current streak of completions and a calendar view of your activity for each habit over time. It also has a strong social focus, with features like “props” (akin to Facebook’s “Like”), comments and step-by-step coaching plans. It’s also one of the few cross-platform apps that you can access from an iPhone, Android phone or on the web. 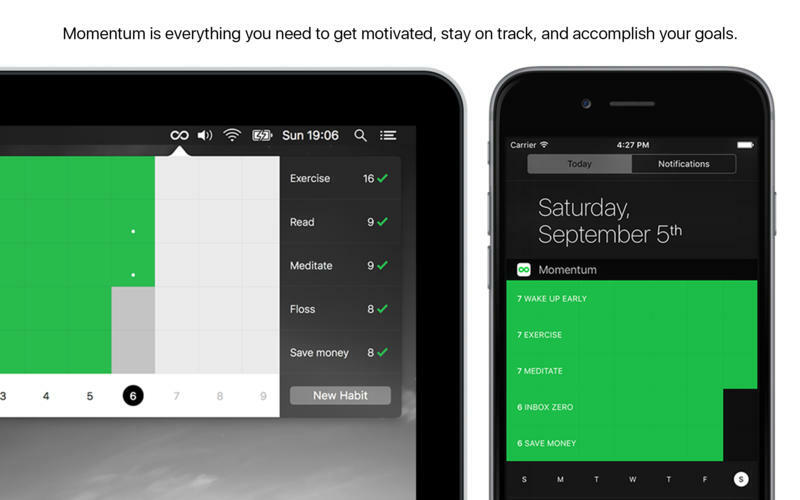 Momentum is one of few habit trackers available on desktop as well as mobile. It uses iCloud to sync your data between the iOS and Mac versions, so you can create, edit, and check of habits on any device. Momentum also has an Apple Watch version that makes it easy to check off habits and see what you have left to do today, and a widget for your iPhone’s Notification Center, so you hardly need to open the app at all. Habit List is only available for iPhone, but for a simple and solid habit-tracking experience, it’s worth looking into. 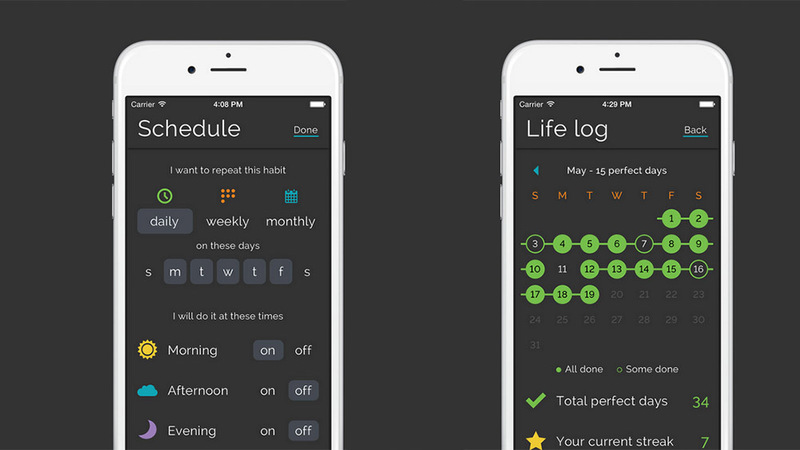 Like Lift, Habit List includes stats on your completion rates, including a calendar view. Habit List lets you choose flexible schedules for completing your habits, like “4 days per week”, or “only on weekends”. It does encourage streaks, though, and starts counting backwards into negative numbers when you skip a day. If negative reinforcement is your thing, this could be the motivation you need. Habit List also includes a “skip” option for when you’re on holiday or otherwise indisposed and can’t complete your habit for the day, which helps you avoid those negative streaks. 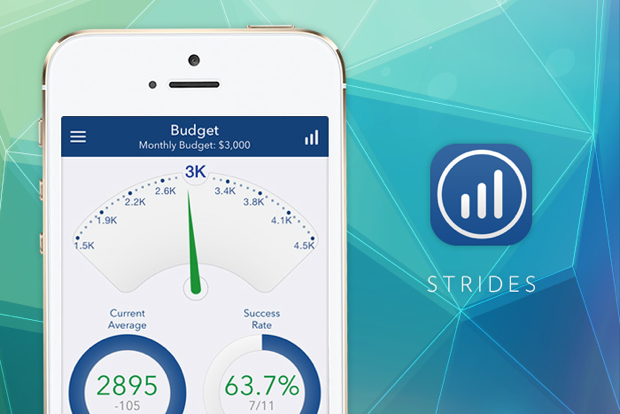 Strides has a broader focus than many of the other apps listed here, as it lets you track specific goals as well as recurring habits. For instance, you can track goals like “Lose 10 pounds by June 15th” or “Save $2,000 by Nov 1st”. With regular habits like running or reading every day, Strides focuses on your streak of checking in to the habit, and colour codes your progress in green or red to give you an idea of whether you’re on track. Strides is one of the more in-depth apps available for habit-tracking, and worth a go if you’ve hit your limits with other apps on the list. Previously known as HabitRPG, Habitica stands out from other apps, both feature-wise and because it takes a unique approach to building habits. This app is modelled on role-playing games, and aims to gamify the process of building new habits and sticking to them. Just like a game, each completion of a habit earns you rewards like gold and experience points. These let you level up and unlock new features. The game analogy continues with failure to complete your habits resulting in lost health and, eventually, death of your character and loss of your progress. HabitRPG’s community aspects are also gamified, including the option to become part of a guild so you can share your goals and swap tips with others. Habitica is the only habit-tracking app I’ve found so far that offers an API, meaning your data isn’t locked in to their platform. At Exist we rely on APIs to gather data, so our options for including habit-tracking data are limited. 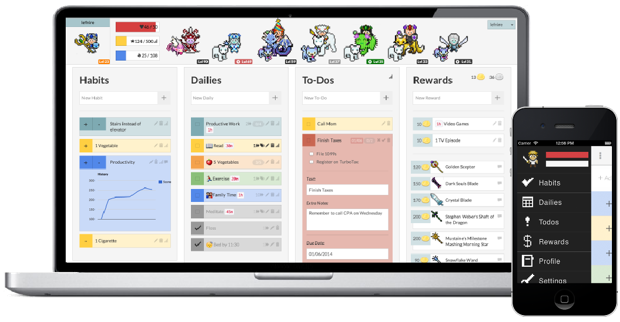 Habitica is also open-source and highly supportive of community-built enhancements to the app. HabitBull recently expanded from Android only to also cover iOS. The app has a familiar calendar layout (very similar to Productive) to show your progress for each goal. It also uses different colours for each habit to make them easily identifiable. If you’re a fan of graphs, you can use HabitBull to see how you’ve progressed with each habit over time, as well as your longest streak of consecutive habit completions, and your success rate. HabitBull also includes community features, so you can share ideas and get support from other users. If you’ve tried Reporter before, you might be surprised to see it on this list. 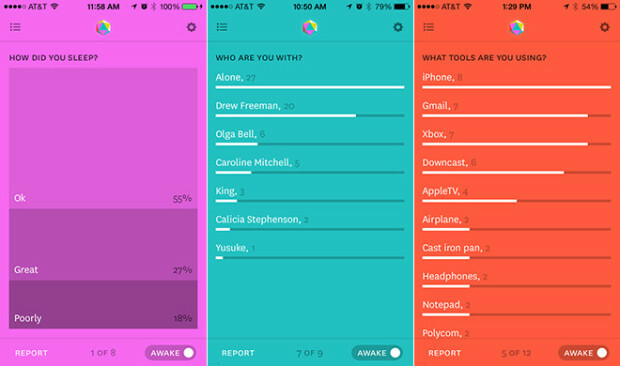 Reporter is essentially a random survey app to help you track the frequency of different aspects of your life. You can choose what questions are included in your survey, and Reporter will randomly alert you during the day to answer them. Pre-set questions that come with the app include “Who are you with?”, “Where are you?” and “Are you working?”. The app gives you a basic rundown of which answers are your most frequent and how many times each has appeared. 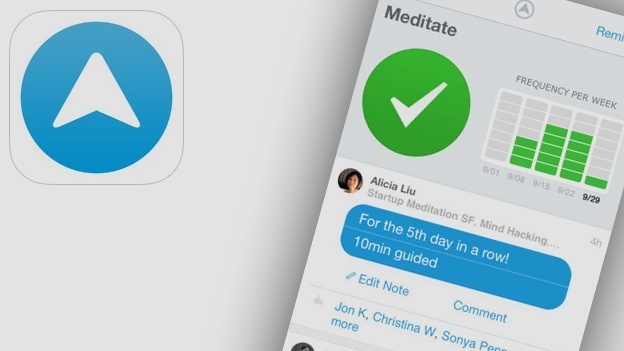 You can make this work as a habit-tracking app, even though it’s not really built that way. The app has a “sleep” setting that pauses survey alerts overnight. When you set sleep mode, you’ll get a specific nighttime survey, and when you turn it off in the morning you’ll get a wake time survey. You could set either of these (I used to use my nighttime survey) to include yes/no questions about each of your daily habits. For instance, mine used to include “Did you play piano today?” and “Did you practise French today?”. The flexibility of Reporter lets you make it work however suits you, but it’s probably best used for tracking habits alongside your everyday life. 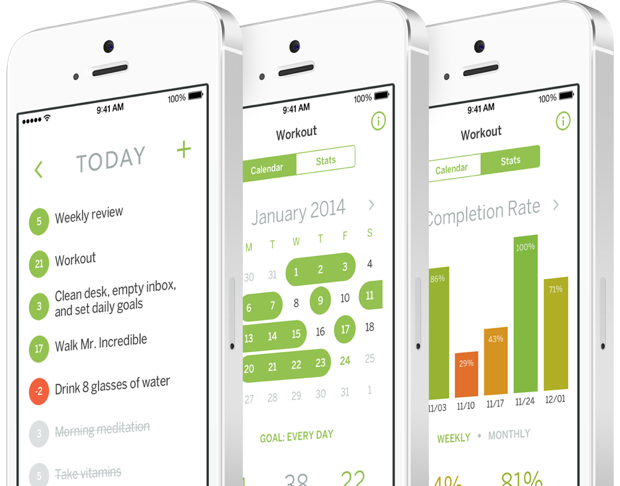 Daily Goals is another really simple app for tracking regular habits. It’s full of brightly coloured dots that represent your different habits and it has a calendar view and daily, weekly and monthly stats to help you see how often you’ve completed each one. 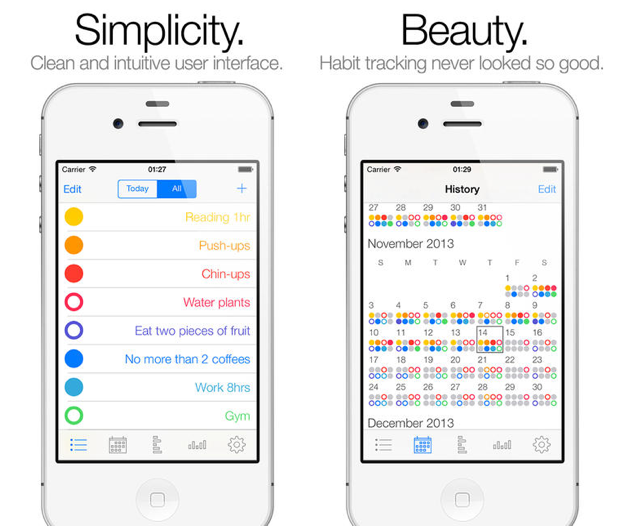 If you track lots of habits, Daily Goals is a colourful app to keep track of them all. I haven’t tried all the apps below personally, but if you didn’t find what you were looking for on the list above, here are some more to take a look at. KeepTrack Android — flexible habits: track mood, workouts, weight, and more. Image credits: Coach.me via T3, Habitica via Habitica, Habit List via Habit List, Strides via designworklife, Reporter via mmminimal, Momentum via Momentum, Productive via Productive, HabitBull via Jason Kolb, Daily Goals via App Annie.